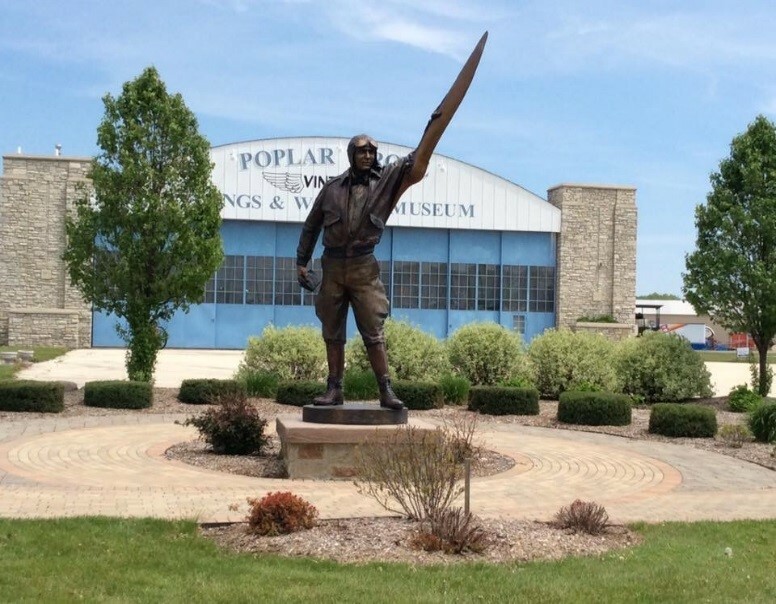 The Poplar Grove Vintage Wings and Wheels Museum and EAA Chapter 1414 are two organizations that have a history of working together to support general aviation in their local area. The museum was chartered in 1997, and soon acquired a 1938 hangar from Waukesha Airport in Wisconsin, which was disassembled stone by stone and moved to Poplar Grove Airport. It was reassembled and renovated at the north end of Poplar Grove Airport and became the main museum building. The museum showcases aviation, automotive and bicycle history from 1903 through 1938. EAA Chapter 1414 was founded in 2005 and now has 114 members. The museum and Chapter 1414 work together on fundraising, restoring aircraft and holding aviation events. They jointly funded construction of a shared multi-use hangar with a kitchen for restoration projects and events. The hangar is used to host monthly pancake breakfasts and Young Eagle rides. In 2001, the museum founded a program for teenagers called Youth Exploring Aviation. It became Post 76 of the Boy Scouts of America Learning for Life Program and welcomes boys and girls ages 15-21. The teens are involved in joint Chapter 1414/museum aircraft restoration projects, as well as flights, field trips, aviation lectures and mini-classes. Together, the museum and Chapter 1414 continue to serve the airport and the community around it offering lectures, movies and safety seminars as well as hosting vintage car meets, aviation activities, pancake breakfasts and fund-raising events. We commend Vintage Wings and Wheels Museum and EAA Chapter 1414 for their efforts in aviation education, mentoring our youth and preserving our aviation heritage. 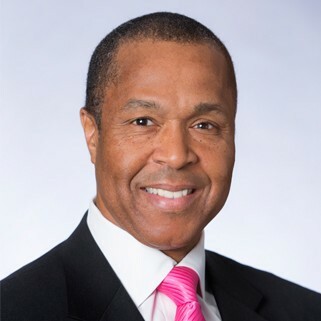 Stephen Davis is a successful businessman with 30 plus years in the construction industry and president of the DuPage Airport Authority in West Chicago, Illinois. He has accomplished much in his tenure with the DuPage Airport Authority, but there is a greater achievement that the IAHoF recognizes with this award. Mr. Davis is founder and guiding force for Tuskegee Next, a charitable organization that is dedicated to carrying on the legacy of the Tuskegee Airmen by training and mentoring young pilots from at risk backgrounds. Tuskegee Next was founded in 2014 with the goal of providing 100 Chicago area students the opportunity to obtain their pilot license by 2025. Davis partnered with Illinois Aviation Academy, a flight school located at DuPage Airport, Tuskegee Airmen Chicago “DODO” Chapter and many other supporters to carry out this mission. Illinois Aviation Academy provides the flight instruction and the members of the other organizations provide mentoring, fundraising and organizational support. Since 2015, Tuskegee Next students have participated in a live-in summer program where, in addition to learning how to fly, they gain exposure to career opportunities within the aerospace industry, learn about leadership, teamwork, citizenship, diversity, military service, careers/training and the importance of education. Mr. Davis oversees this program and provides motivational support and guidance to the students. As of September 2018, 32 students have entered the Tuskegee Next program, 31 have soloed and 27 have earned their pilots license. A talented fund raiser and organizer, Davis works with government and industry to generate support for Tuskegee Next. This year, the inaugural Red Tail Ball at DuPage Airport attracted 330 guests who ate and danced the night away while honoring the legacy of the Tuskegee Airmen and investing in future pilots. Beisswenger is president of the USUA as well as the United States delegate to the committee of the Fédération Aéronautique Internationale (FAI) pertaining to microlight activity around the world. There he has helped set competition and record setting policy for the sport on a world-wide basis. We salute you for your contributions to aviation in Illinois, and for your work with Tuskegee Next. Robert and Ruth Frantz were known throughout the Chicago-area aviation community for their dedication to a variety of aviation organizations. As a couple, they have owned a variety of aircraft, from a Bamboo Bomber to a Piper Arrow. They enjoyed fly-in events, proficiency air racing and many other flying activities. As a couple, they were staunch supporters of a variety of aviation support organizations including the Illinois Pilots Association, United States Pilots Association, North East Pilots Association and Chicago Area Chapter Ninety-Nines. Both held a variety of offices in those organizations at both local and national levels. In addition to leadership roles, both could often be found working at organization events and safety seminars, doing the tasks the make those events happen. Bob and Ruth were deeply involved in proficiency air racing, as participants and at the organizational level. They raced both the Illi-nines Air Derby and the Ninety-Nines Chicago Area Chapter Air Meet for many years, winning or placing in the finals numerous times. Bob provided the program and oversaw the scoring for both races for many years. 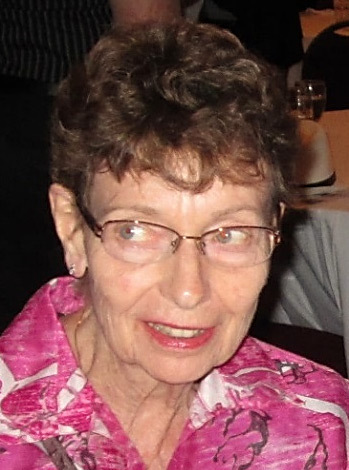 Bob passed from this earth in November of 2014, and Ruth passed in March 2018. Their infectious smiles and supporting hands are greatly missed by the organizations they supported and the Illinois pilots who knew them. We salute them for their years of volunteer service on behalf of aviation organizations in Illinois. Keith Mueller is a flight instructor, mechanic and aviation educator. He has flown as a corporate pilot and served many hours as a flight instructor. Mueller began as a mechanic for Ozark Airline, which was later merged into Trans World Airlines and then finally became part of American Airlines. 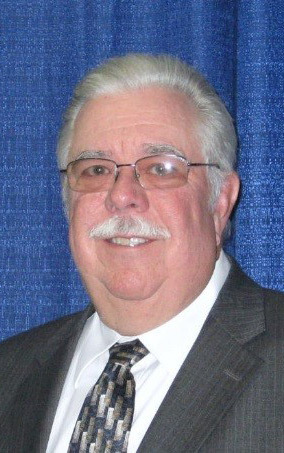 Mueller retired from American as Central Regional Manager for Aircraft Maintenance and Engineering in 2015. Mueller was a flight instructor and Assistant Chief Flight Instructor with the Belleville Area College Aviation Program in the 1980s. He later became the part-time coordinator for that program until it was discontinued. Belleville Area College became Southwestern Illinois College (SWIC) and Mueller, while still working at the airlines, became the part-time Aviation Program Coordinator for SWIC. He developed the Aviation Pilot Training Program, the Aviation Management Program and then the Aircraft Dispatcher Program. 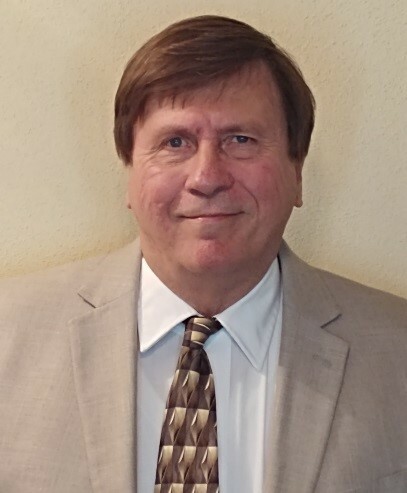 In addition to Mueller’s significant accomplishments with the airlines and SWIC, he has a long history of volunteer service in the aviation community. He has promoted aviation to local school districts teachers and students in St. Clair, Madison, Randolph and Monroe counties. In 2017, he was a planner and participant for a STEM Aviation Day at MidAmerica Airport that was attended by over 200 local teachers. He is a member of EAA Chapter 64 and participates consistently in their Young Eagles program. He provides leadership in the Greater St. Louis Flight Instructor Association, and volunteers at the Greater St. Louis Air and Space Museum. He is always a willing mentor to young adults interested in aviation. We salute you for your contributions to the aviation program at SWIC, your mentorship efforts and your devotion to the aviation community. Everett Earl Outland was airport manager at Mt. Vernon Outland Airport in Southern Illinois in the post-World War II years and was part of a team that had the vision and skill to develop the airport from its modest beginnings into a municipal airport with airline service. Outland began flying in his 20s and operated the Mt. 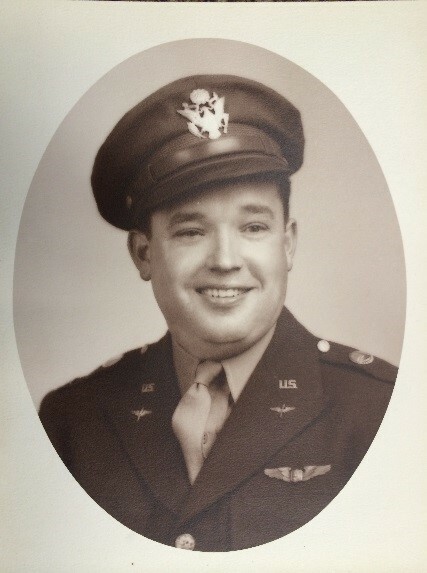 Vernon airport before entering the Air Force where he served as Director of Training for the Air Transport Command. After his discharge from the service in 1946, Outland returned to Mt. Vernon again as airport manager. Outland provided sales, flight and instructional services. In 1956, Outland moved to Abilene, Texas and managed the airport there for 3 years. In 1955, Mt. Vernon voters approved an airport authority and the first paved runway was built, followed shortly by a paved crosswind runway. In 1959, Outland returned to Mt. Vernon as airport manager. He and Chester Lewis, Mt. Vernon’s city manager had a larger vision for the airport. This was before interstate the highways were built, when Mt. Vernon was a relatively isolated community. Outland’s vision was to win approval from the Federal Aviation Agency and persuade Ozark Airlines to establish regular air service at Mt. Vernon. In 1962, Outland’s dream was realized when Ozark introduced daily commercial service to Mt. Vernon Airport. The airline activity was directly responsible for making Mt. Vernon a transportation center in southern Illinois and influencing the location of Interstates 57 and 64 near Mt. Vernon. Outland passed away from a heart attack in 1966 at the age of 53. The Jefferson County Board honored him by renaming the airport Mt. Vernon Outland Airport. We salute him for his efforts in developing Mt. Vernon Airport and his support of the Mt. Vernon community. Doug Powers has shown that sometimes events in life go full circle. His interest in aviation began as a Boy Scout when he won a flight for being Scout of the Year. He went for a ride in a Piper Tri-Pacer out of Ravenswood Airport located just off the end of what is now Chicago O’hare Airport. Later in life, he would found Aviation Explorer Post 9 at Palwaukee (now Chicago Executive) Airport. Powers enrolled in the Flight/Maintenance program at the University of Illinois at Champaign and received his Commercial Pilot Certificate and Airframe Mechanic Certificate. He became friends with some of the air traffic controllers at the Champaign Tower, took the entrance test and scored well enough to have his pick of duty locations. He became a controller trainee at O’hare. 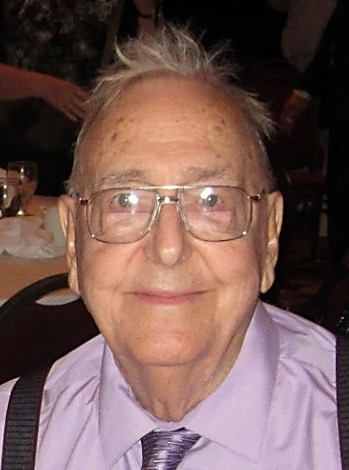 Over the years, he worked both tower and TRACON at a number of facilities including O’hare. Later, Powers became a manager, and then worked as a Branch Manager in the FAA Great Lakes Regional Office. Finally, prior to retirement he served as the FAA Regional Runway Safety Program Manager for 2 years. Powers had always enjoyed giving career presentations at local high schools and encouraging young adults to consider careers in aviation. With his background as a pilot, controller and mechanic he was able to steer youth into a variety of career paths. In 1995, wanting to work more directly with young people, he started Aviation Explorer Post 9 at Palwaukee Airport. He became the first post advisor, a position he continues to hold to this day. Powers has used his connections in the aviation industry to help his explorers gain a wide variety of experience and learn leadership skills. He has truly given back much to scouting and the aviation community. Many of Post 9’s explorers have gone on to attend university aviation programs. They have become military pilots, airline pilots, aeronautical engineers, air traffic controllers and mechanics. Post 9 Explorers also demonstrate their sense of duty to their community by marshalling Young Eagle flights, supporting Aviation Explorer Base Camp at Oshkosh each year and working at airport events. Some of these youth have also returned to serve at the Explorer Post in leadership positions after college. We support you for your work with the air traffic control system and for your efforts mentoring our youth and the development and continued support of Explorer Post 9.